Judge Gene Strassburger of the Allegheny County Court of Common Pleas issued a March 2, 2010 Opinion and Order severing a third party claim from a UIM claim and Bad Faith claim against the carrier in the case of Wutz v. Smith and State Farm, GD07-021766 (Allegh. Co. March 2, 2010 Strassburger, J.). In this case, the Court was faced with a joint motion by the Defendants to preclude any mentioning of insurance during the trial of the matter. The Court was also considering the Plaintiff's motion to sever the claims and the Plaintiff's request to proceed first on the UIM and bad faith claims. In Wutz, there was a little twist on the ordinary scenario. The third party tortfeasor was covered by a Progressive Insurance $15,000 liability policy, which was offered in settlement. Pursuant to the consent to settle clause in the UIM policy, the Plaintiffs sought out State Farm's consent to settle. The indications were that the Plaintiff was going to accept a settlement with the tortfeasor. Removing the tortfeasor from the case would take this matter out of the Allegheny County line of cases that held that evidence of "insurance" was not admissible at trial where the tortfeasor was still in the case. Exercising the option given by the case of Daley-Sand v. West American Ins. Co., 564 A.2d 965 (Pa.Super. 1989), to either consent to the settlement or, instead, pay the settlement amount and be subrogated to the Plaintiff's claim against the tortfeasor, State Farm elected to pay the $15,000 settlement offer to the Plaintiff. Accordingly, this case now contained State Farm's subrogated claim against the tortfeasor. State Farm apparently believed that this scenario would implicate the line of cases holding that "insurance" issues were not admissible in these post-Koken trials still involving the tortfeasor. Judge Strassburger rejected State Farm's position that "insurance" should not be mentioned in these types of trials involving both a tortfeasor and a UIM carrier under an argument that such evidence would prejudice the tortfeasor. The Judge noted that, in the context of this case, there really was no "live" dispute between the Plaintiff and the tortfeasor given State Farm's action in paying the settlement amount offered by the tortfeasor. Since there was no longer any live dispute against a tortfeasor in this matter, Judge Strassburger also thought it appropriate to sever the cases and to allow the Plaintiff to proceed on the UIM and bad faith claims first. 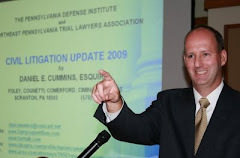 The Judge noted that, under the Gunn decision issued by Judge Wettick in Allegheny County, the UIM trial by jury would be first, followed by a non-jury bad faith trial with the same judge. Judge Strassburger also denied the Defendants' request to keep out references to insurance. Judge Strassburger noted that State Farm could proceed on its trial against the tortfeasor thereafter if it still desired to do so. Whew! This stuff is getting complex! Please be reminded that I am keeping a Post-Koken Scorecard which you can access by scrolling down the right hand column of this blog and clicking on the reference to the Scorecard. Anyone desiring a copy of this Wutz v. Smith and State Farm decision may contact me at dancummins@comcast.net.